Alternately, Fenton’s Creamery in Oakland, California, claims that William Dreyer based his recipe on a Rocky Road ice cream invented by his friend, Fenton’s George Farren, who blended his Rocky Road candy bar into ice cream; however Dreyer substituted pecans for almonds. In a large saucepan, mix cocoa powder and sugar. Gradually stir in milk. Stir over low heat until sugar and cocoa dissolve. Stir in vanilla, salt and whipping cream; set aside. Shred chocolate with coarse side of grater. Stir shredded chocolate, marshmallows and almonds or pecans into cocoa mixture. Pour into ice cream canister. Stir marshmallows evenly throughout frozen mixture before serving or ripening. “Dreyer’s History”. http://www.dreyersinc.com/about/WebHistory.pdf. Retrieved April 5 2006. 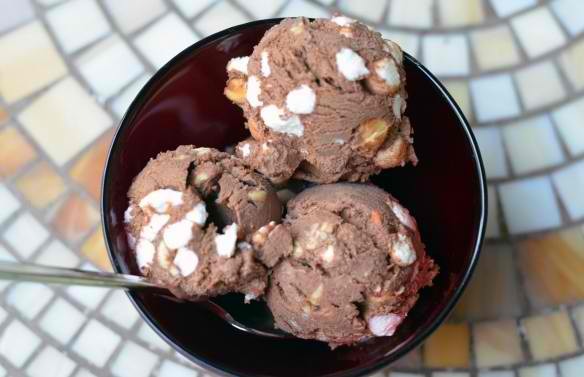 “Fenton’s Blender Club:Rocky Road Ice Cream”. http://www.fentonscreamery.com/blender.html. Retrieved April 5 2006. “Rocky Road Ice Cream”. http://www.recipesource.com/desserts/ice-cream/00/rec0095.html. Retrieved April 5 2006.